This is Shetland ewe Nugget and her ewe lamb Lulu. 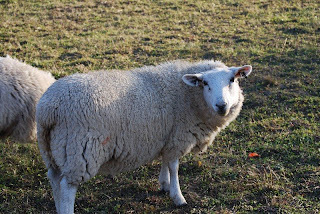 Nugget is one of my largest ewes; she has soft, crimpy musket (oatmeal grey) fleece. Lulu is a wonderfully soft, crimpy white lamb. And Lulu is a big girl! These girls are taking a break in the barn. 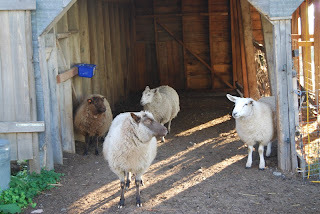 Shetlands Lily (moorit), Nugget (musket) and Lulu (white) are on the left. One of our two Cheviot ewe lambs is on the right. This is a good picture to illustrate the size difference between the Shetlands and Cheviots. Nugget (Shetland ewe) is on the left. She is a little smaller than the Cheviot ewe lamb on the right. 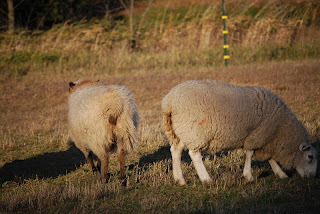 We bought the two Cheviot ewes from Kathy and Al Munkelwitz in Isle, Mn. The Cheviots will be put with a Blue Faced Leicester ram in December. 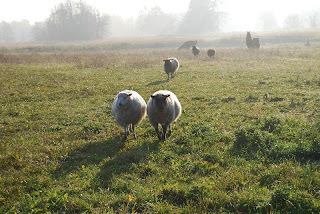 In the spring, we will have our first Mule Sheep from a BFL-Cheviot cross! Here is another picture of a Cheviot girl. I still can't think of names for the two girls. Ideas anyone?? 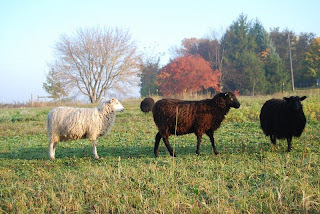 Roundaboutacres also added two BFL-Shetland Mules to our flock this year. These two lovely ewe lambs - white and colored Mules - were purchased from Laura at Psalm 23 Farm. On the right is a Shetland ewe lamb. 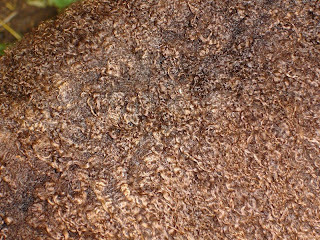 This is a close up of the colored Mule's fiber. Purly and lustrous!! You have a Nessarose? What a cool name! From "Wicked," or some other source? Yes, she is named after a character in "Wicked." Her previous owner loves that play. She named several llamas after characters. First photo is really, really good Mom. The two lambs have the color of Apricot poodles. How beautiful all your lambs are.